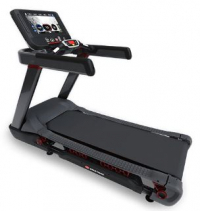 The FreeRunner™ treadmill is a revolutionary new indoor running experience. The heart of this new experience is the patent-pending HexDeck System, featuring an aluminum deck supported by a proprietary, hexagonal polymer suspension system. 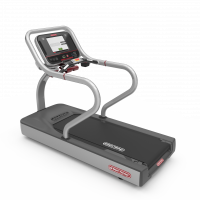 The result is unprecedented cushion and responsiveness, for a feel that test users describe as “buttery,” “easy on the joints” and “like running on a track.” The next generation of treadmills arrives March 2019. 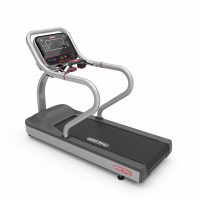 When you're looking for a full commercial treadmill experience with a budget in mind, the 8-TR is a great place to start. 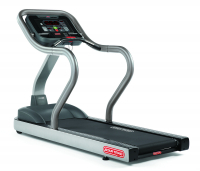 Pre-wired for the S Series PVS entertainment system and powered by a 5-HP AC motor, the S-TRc treadmill features a user-friendly console and keypad with a large service scrolling message window, user-specific workout programs, a dedicated heart-rate display, Polar telemetry, and multiple cup and accessory holders. The Soft Trac triple-cell cushioning system provides maximum shock-absorption, and centered dual-adjustable personal fans enhance comfort. 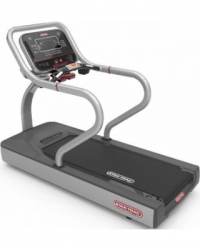 The S-TRx treadmill is pre-wired for the S Series PVS entertainment system. It boasts metallic silver handrails with an hourglass contour for a sleek look and improved function. 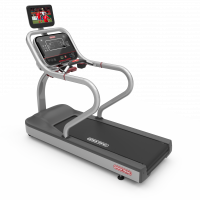 The user-friendly console features a large message window, motivational track, 10 exerciser-specific workouts, a personal fan, and multiple cup and accessory holders. The Soft Trac triple-cell cushioning system provides maximum shock-absorption, and adjustable personal fans enhance comfort.